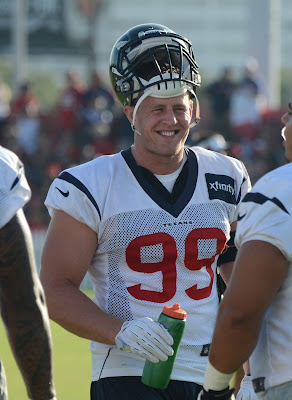 HOUSTON, TEXAS (July 21, 2016) It is being reported by ESPN.com that Houston Texans defensive end J.J. Watt (shown left) underwent back surgery on Thursday, July 21, 2016. It was the second surgery in the past six months. As a result, he will begin training camp on the Physically Unable to Perform list and will miss the preseason for the Texans. In January, 2016, Watt had the first procedure in which partially torn core-area muscles, three adductor and two abdominal were repaired. The defensive end has never missed a game during his time with the Texans. Houston kicks off the pre-season with an August 14, 2016 matchup against the San Francisco 49ers at Levi’s Stadium in San Francisco. They will play their first home pre-season game on August 20, 2016 against the New Orleans Saints.